We LOVE how BeautyMark Marketing's latest re-brand project for professional skincare brand Dermworx turned out! AcneWorx is a non-drying 2% Salicylic Acid Cream that uses patented nanotechnology to employ a water-based vehicle. It has clinically proven efficacy, but without the skin-drying or irritating solvents found in most salicylic acid formulations. MoistureWorx is a novel, non-greasy white petrolatum delivered as a fine mist spray.﻿It is a highly effective skin protectant and moisturizer without the inconveniences associated with traditional white petrolatum products. CerumWorx Stable 10% Vitamin C Serum is a highly-penetrating and stable vitamin C serum for anti-aging and skin repair.﻿While many vitamin C serums lose potency rapidly after first use, our unique formulation helps maintain potency over time and deliver optimal benefits to the skin. 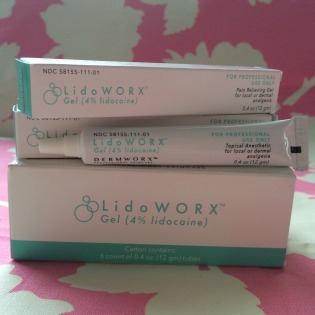 LidoWorx 4% Lidocaine Gel is a rapid-onset topical anesthetic for professional use only. Juventio's proprietary Small Molecule Soluabilization System provides highly efficient skin penetration, which translates to less "waiting" time for the patient.